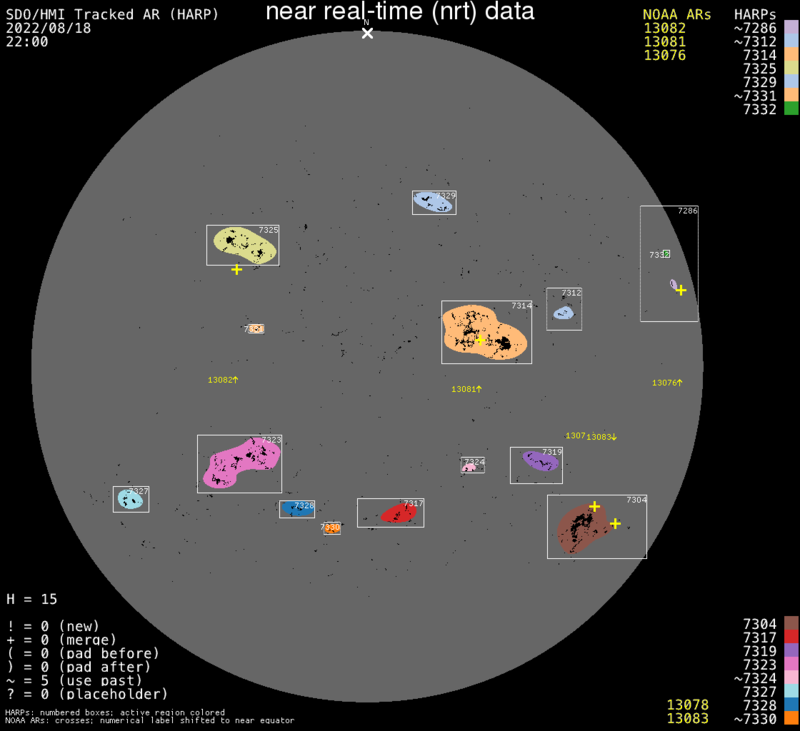 Well, I did submit the images, data and calculations for the Planetary Transit Special Award. The pictures show the over 2 foot picture of the composite images of the Sun and a close up showing the parallax between the two sites. The idea is to calculate the distance between the Sun and Earth ( 1 AU) using this information. I believe I did not bad, so we’ll wait and see what the coordinator of this program says. Saturday evening was the first time in a very long time where the seeing was relative good for planetary imaging, so I gave Jupiter a try. Made a total of 8 series and one of them was usable. The GRS is just rising at the preceding limb and the NEB shows a large disturbance. Where are those rainy and cloudy days good for? To reprocess and process the images which have not been processed yet. The seeing that night was terrible, but I am glad with the way the reprocessed series came out. Here an overview of half of the double mutual event on January 28th when Io got eclipsed by the shadow of Europa. The full double event can be seen in the animation. Click image on right for the animation. Well, as expected the triple shadow transit was clouded over. I followed the transits and events on-line. Was hoping that the Griffith Observatory in LA would bring some nice images, but the feed was terrible. Very unstable skies. Every once in a while you could see some banding. Bate-Papo from Brazil had the best feed for most of the event, but they stopped showing before the third shadow showed up and went into a discussion reviewing what had happened, so Heart of Texas was the final straw!! Below screenshot of the three shadows just before Io’s shadow runs off the disk. 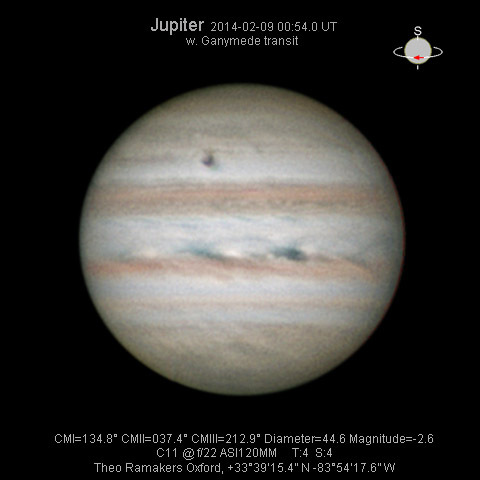 Some of us are hoping for clear skies to see the Triple Shadow Transit on Jupiter in the early hours of 1/24/2015. However, that is only part of the story, and here is the rest. The fun starts around midnight when the shadows of Io and Calisto are visible on Jupiter and the moon Io is already in front of the Jovian disk near the Eastern limb. As time goes on you will notice that the distance between the shadows declines as they transit across. This is because the shadow from Calisto, which is much farther away from Jupiter than Io, moves relative slower on the planetary disk than the shadow from Io. Around 0:40 AM, Io’s shadow will have caught up to the shadow of Calisto and they will merge to one shadow. However at the same time, Calisto’s shadow ”beam” will also partially eclipse the moon Io, so Io will become partially dark, which shows up from our vantage point as a small shadow against Jupiter behind it. This shadow will pop up out of nowhere, and is only visible for a few minutes. In the meantime around 1:15 am, Io has moved ahead and has caught up with Calisto’s shadow, and now it will start to cover, and block our visibility of the shadow of Calisto on Jupiter. Io will not totally cover the shadow, but the change of the ”dark” shadow should be very well noticeable. Finally, at 1:30 I would expect Europa’s shadow as well as the moon Calisto have moved onto the planetary disk as seen from Earth and you have arrived at your “Triple Shadow Transit”. So you thought you’d see three shadows only? 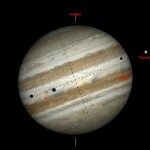 Now you know what to look for in the 90 minutes leading up to the Triple Shadow Transit. And once you have seen this, think again what you just witnessed. This is why I am so excited this year about the chance to see what those many “Mutual Events” of the Jovian Moons create for us to observe from Earth. Complicated? I’ve added some screen shots of what will happen to make it better understandable. In 2009 I was pretty active in Planetary imaging, including imaging the Mutual Events between the Jovian Moons. This year Earth and Jupiter are lined up again for these events, but so far the weather has been terrible here. Tonight however, we had clear skies and as so many times in 2009 the conditions were awful. Although no clouds, the Jetstream and wind gusts caused seeing conditions of 1 to 2 out of 6, which translates to a very wavy planetary disk. However, I wanted this so bad so took a chance. Captured 48 total images in R, G, B and IR and ended up using 3 IR images. 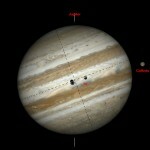 The animation shows Jupiter and its moons in IR at 02:22.0 UT, 02:35.6 UT, and 02:473.7 UT. The shadow is from Ganymede. Ganymede is moving from the right to the left towards the Jovian disk, while Europa which just appeared coming from behind the disk, moves to the right. At 02:35 Ganymede which was in front occulted Europa. (The middle image). Apologies for the bad quality. This was not caused by a lack of processing, and yes, the moons have been pushed a bit in levels to make them brighter in the images. Click the thumbnail to see the animation. In the evening of January 18th, the Jovian moon Ganymede occulted Europa. While Ganymede was moving in front of Jupiter towards the Jovian disk, which showed its shadow, Europa came from behind the disk while moving to the right in the sequence. At 2:34 UT Ganymede occulted Europa. The seeing conditions were bad up to 1-2 out of 6, but if you want to capture such an event you don’t ask for anything but that you can see it. I took 12 sets of LRGB captures for a total of 48 images (Just in case). A total of over 18GB of data, and ended up using only three IR images. The moons have been pushed quite a bit to make them come out better. This was my first capture of Jupiter, and a Mutual Event as well, during the current apparition. Click the thumbnail to see the animation. Saturday evening March 1st was very nice with stable skies. 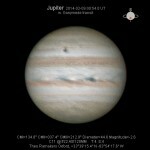 Larry Owens and I did take the opportunity to make the first JWF image with the new Big-O scope. 1500 out of 3000 stacked in Autostackert2 and sharpened in Registax6. The calm after the storm from Friday morning. The seeing was good at times, and a lot better than in recent months. Captured 4 complete IRGB series stacked and de-rotated 3 of them while the Great Red Spot was transiting the central meridian. Each avi 3000 frames and stacked 1000 in each. Well, the storm of the decade was good for something, it gave me time to process my Jupiter images from last Saturday with the Ganymede transit. This is an 11 minute capture of two RGBI series with a total of 32,000 frames of which 4,000 were stacked in AS2, sharpened in Registax 6, derotated and color combined in WinJupos and post processed in Photoshop. Not bad for the first serious derotation process attempt with some reasonable data.